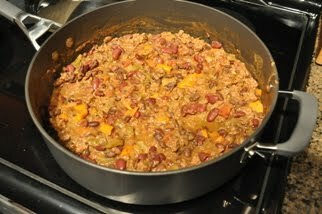 This is a slow carb recipe for beef chili that we threw together one night, and were very happy with it. For two people, this recipe makes plenty, enough for dinner and leftovers for lunch the next day. You can easily swap the beef for ground turkey, which we also like to do to change things up. It`s simple to throw together and just walk away for a while as it cooks. Give it a try and let us know what you think! Add some olive oil to a deep pan / pot, and heat under medium heat. Crush the garlic and dice the onion, pepper, celery. Add to the pan, and stir it up. Cook a few minutes until the vegetables are tender. Add the ground beef. Break it up with your spoon, and stir things around again to brown the meat. After another few minutes and the beef has been browned, add the kidney and black beans, and the diced tomatoes. Fill the pot with water until everything is nearly covered, and add the seasonings. Cover, and simmer for 1-2 hours. After simmering, remove the lid and reduce the volume by boiling the water away. When you have achieved the consistency that you desire, adjust the seasoning to taste and serve. For an extra kick, chop up a jalapeño or two and add to the vegetable mix at the beginning. If your diet allows it, you could throw a handful of quinoa into the chili as it cooks. Also, while probably not allowed on any form of a strict slow carb diet, you could top off a serving of this chili with a handful of shredded cheese or sour cream. Any way you serve it, we hope you enjoy it! Leave a message and let us know how yours turns out!